Bali is an incredible island full of culture, stunning temples, beaches, beautiful rice fields and delicious cuisine. The best part is that it’s really cheap! Considering the prices of places like Bora Bora or the Bahamas, Bali is a perfect spot for people looking for an exotic vacation for several days and with a budget. Bali is an Indonesian province, located between South Asia and Oceania. The most expensive thing you must consider is the plane ticket. Depending on where you depart from will determine the price of the ticket to reach Bali. One really cheap way from America is making a stop in Los Angeles and then going South. It’s a long way to go but it’s totally worth it. On the island you can find many ancient temples that have survived earthquakes and even volcanic eruptions. 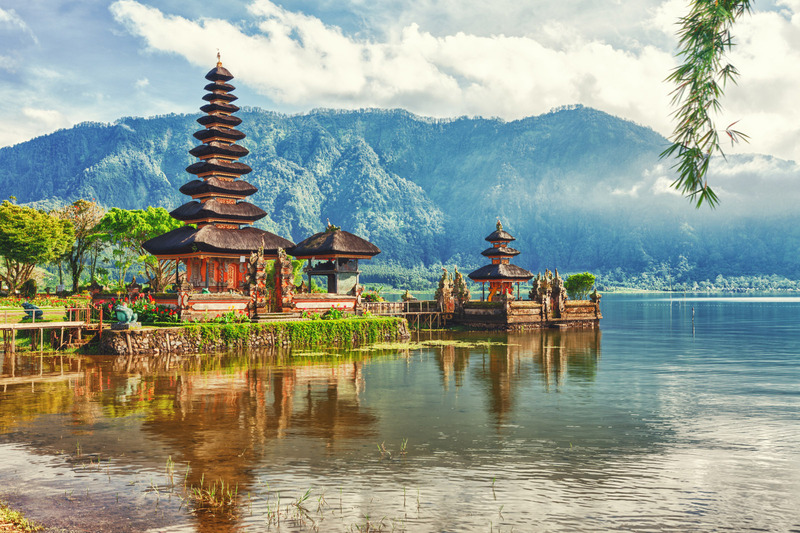 In the Bratan lake you can find the Pura Ulun Danu Bratan temple which is dedicated to the goddess who inhabits the center of the island and it’s something you must see. The Balinese architecture combined with the water and the sunset will create memories difficult to forget. You can also visit the Tanah Lot temple near the sea or scuba dive and see the coral reefs or also practice water sports on the roaring waves. Don’t forget to try out Balinese cuisine in which rice is an important element. The food is a delicious combination of spices, fresh vegetables, meat and fish. There’s a great population of Hindi people, therefore Balinese people rarely consume beef. If you do a little research you can find accommodations of 3,000 Mexican pesos for a month! And you can eat with approximately 4 USD per day. You can even make a little trip all around South Asia and end the journey resting on the amazing Balinese beaches. So, what are you waiting for? Cheap: Not expensive, or costing less than usual. Province: One of the large areas into which some countries are divided. Inhabit: To live in a place. Hindi: Person who practice the religion of hinduism. Read about Balinese culture and write down five differences between their tradition and yours. Share what you find with your Learning Advisors. What type of places do you like to visit? Big cities, forest, beaches or ancient ruins?